Your event registrants are passionate about the upcoming event - make it easy for them spread the word to all their friends and co-workers! Active's online event registration system now features Facebook, Twitter and email sharing widgets on the registration form confirmation page enabling the registrant to invite all of their friends, contacts and followers to come and take part. It only takes one tweet to get your event in front of hundreds of new potential attendees. 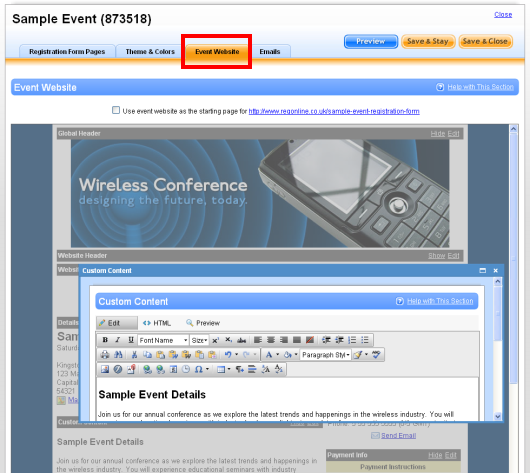 Make sure you include these widgets on your confirmation page when you set up your next event! Log into your Active RegOnline Account. Click on the event you would like to create a web button for. Click on “Button Designer” under Additional Resources. Once you click on “Button Designer”, you will see a pop-up window like the one below. Select “Button” and click Next. Choose where your button will link to (e.g. your Registration Form, the Event Website, or your Events Calendar). Customise the color and text of your web button. The system will automatically generate the HTML code for you to use! Just copy the code and paste it into your website. The web button will appear where you placed it, with a live link to your online registration form. For maximum visibility, place the button on the top half of the right hand side of your web page and watch your registration numbers rise! If you have already created an event registration form, you may have noticed that our event management software offers a variety of other types of online form templates. 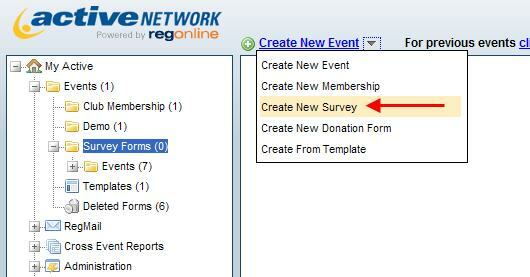 Try using the online survey form template to collect attendee feedback after your event is over. Providing your participants with a quick and easy way to submit their feedback online will increase the likelihood that they will respond. Many event organisers include a link to their online survey form in an email delivered hours after the event has finished. You may want to consider providing an incentive to complete the form such as a discount code for next year's event. Not only will you get valuable feedback but also a head start on marketing next year's event! Email can be a low cost and highly effective form of event advertising. 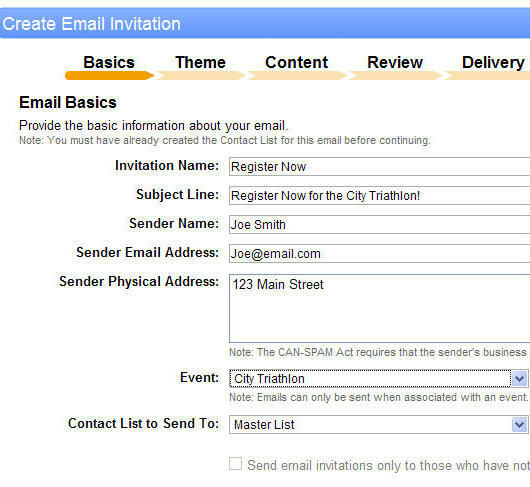 Reduce your printing costs, more easily track your return on investment, and increase event attendance with Active's easy to use email invitation tool. Active's event management software includes an integrated email marketing feature that clients can use free of charge to advertise their events. 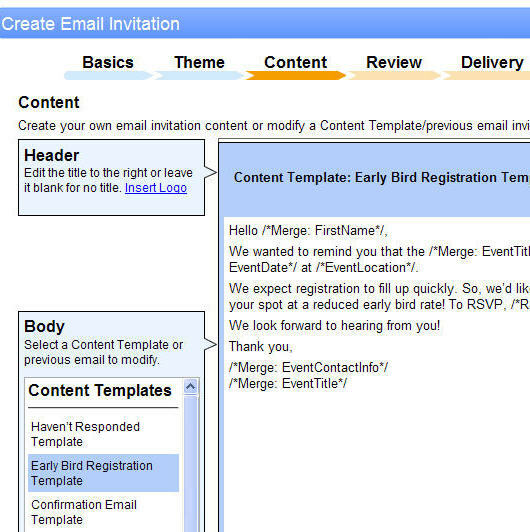 Upload as many contacts as you like into the system and send them beautiful invitations to register for you event. Reporting features will enable you to track email open rates and registrations that resulted from your email campaign. Start creating your email invitation by selecting the event you want to associate it to and the contact list you would like to mail it to. 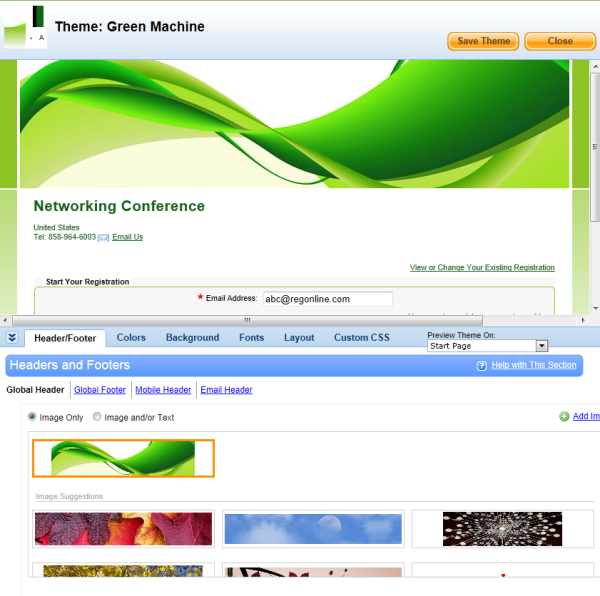 Choose a pre-designed theme or create your own. Write your content or choose a template that is commonly used by other event organisers. You can merge the contact's name and other information into the content if you choose. Once you have finished creating your email, all that is left to do is schedule delivery, relax, and watch the registrations come in! 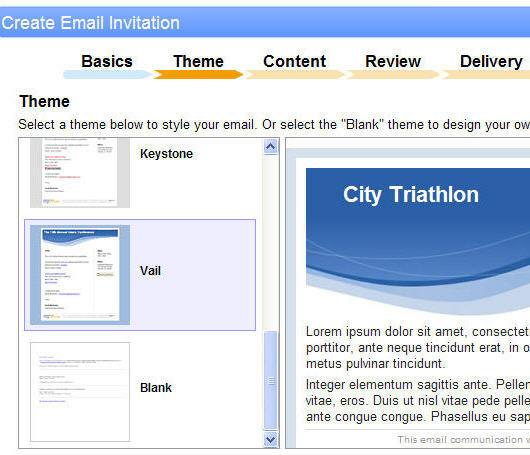 For more information about Active's email marketing system click HERE. Active’s new and improved team registration feature will make it easy for team captains to register their teammates. Team captains can create their team name, register each team member and then return to the event registration form at any time to edit team member info, change the team name or add more participants to their roster. Team management is also easy for the event organiser. View team reports, limit the size of a team, designate a new team captain, substitute participants and cancel team members. 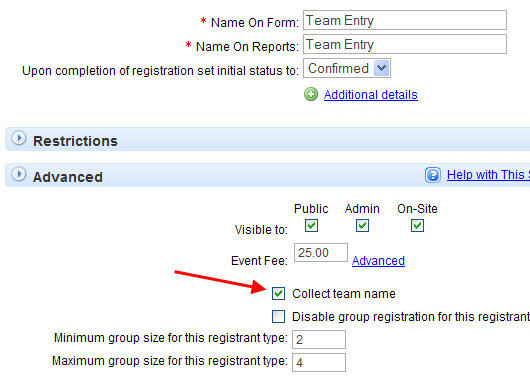 To activate team functionality for a registration type, open the Advanced area within that registration type and select the "Collect Team Name" feature. You can also limit the size of the team on this screen. Team name data can be viewed in all standard and custom reports. You can also merge the registrant's team name into all confirmation and follow-up email. And now for our first product feature tip (which you may already be aware of): our registration form builder will allow you to embed the form on a page of your own website! This feature is called iFrame and is easy for any event director or their webmaster to use. Simply copy and paste this code into a page on your event website. The online registration form will embed itself on the page with all of the design and navigation elements that appear across the rest of your site. This feature is really great because the registrant will fill out the form without ever having to leave your event site!